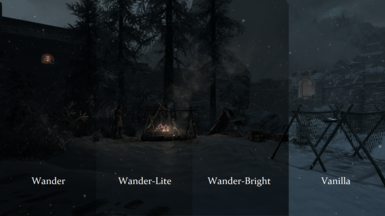 Wander is a simple weather solution, enhancing and adding variation while preserving the colors and spirit of Vanilla. No scripts. 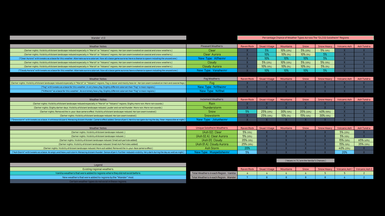 Multiple versions available. 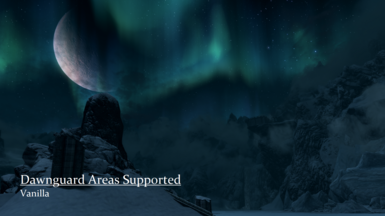 You are free to use and modify Wander in any way that will enhance your personal playing experience, but please do not upload a full, partial, or tweaked version of Wander anywhere. 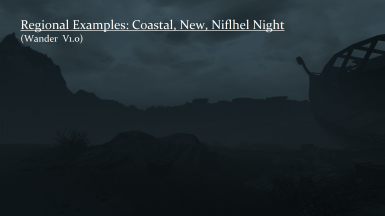 I will release a version for Bethesda.net for the Xbox and PS4 after some testing by the community here. 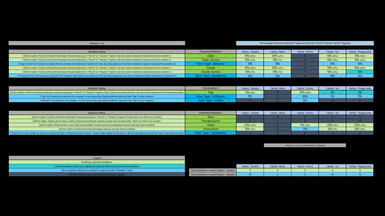 Initial Release. 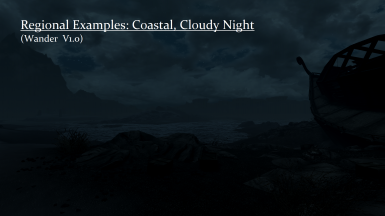 Darker Skyrim nights. 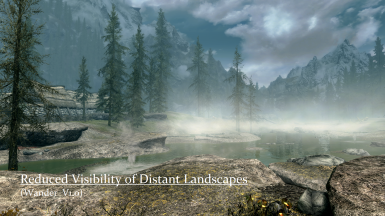 Reduced visibility of distant landscapes. Inclusion of missing weathers. 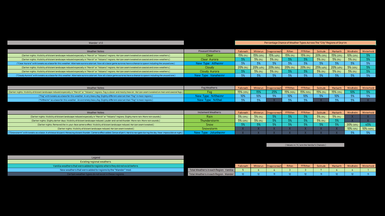 Addition of new weathers. 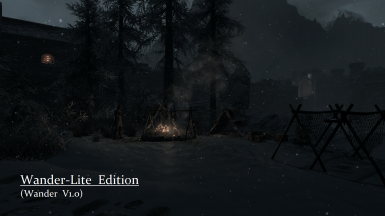 Wander-Lite edition has been added as a main file. 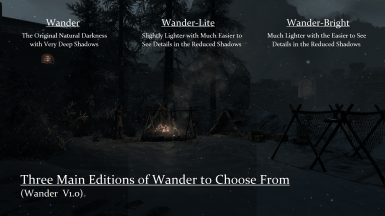 This edition of Wander has slightly lighter nights and easier to see details in the shadows over the original edition. 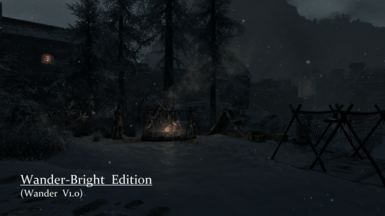 Wander-Bright edition has been added as a main file. 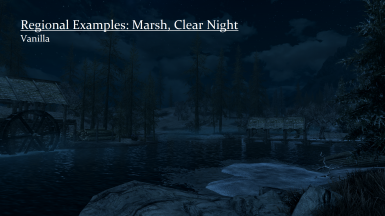 This edition of Wander has brighter nights and easier to see details in the shadows over the original edition. Let me introduce myself, I am Wanderhall the Blue, and I am a Wizard of the weathers of the world. 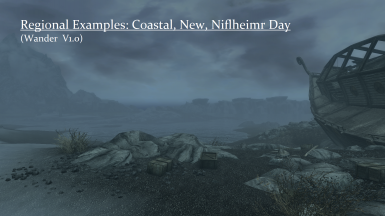 While I’ve released my first two mods on Bethesda.net for the Xbox, Wander is my first large mod release, and first mod release here on the Nexus. 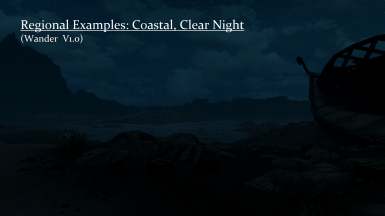 Wander began as tweaks in my personal tweaks mod for darker Skyrim nights. 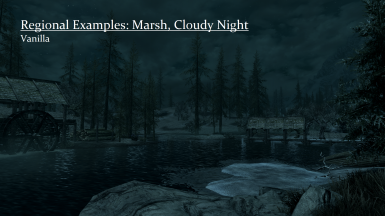 I enjoyed learning and modifying the weather, more than most of the others projects I was fiddling with so I ventured into other weather related tweaks. 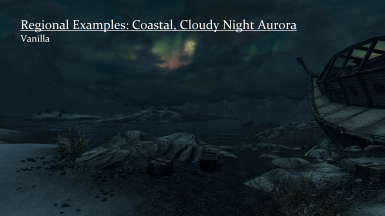 With the volume of weather modifications getting extensive and complete with so much time invested, I made the decision to separate the mod out of my personal tweaks mod, rebuild it, and release it for all to enjoy. 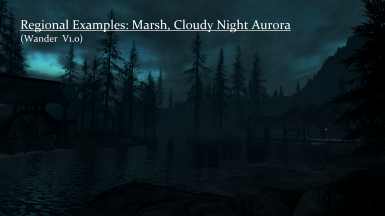 I’m still relatively new to modding, and this is my first Nexus release so please bear with me. 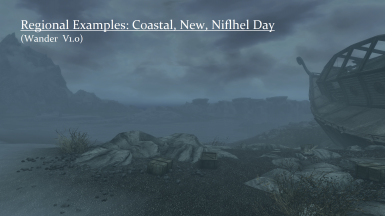 I really hope you all enjoy this mod, as I’m very proud of what I was able to accomplish with it. 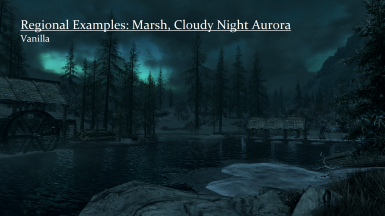 05 April 2019 - UPDATE: Work on the alternate lighter versions has been completed, and they are now available to download. 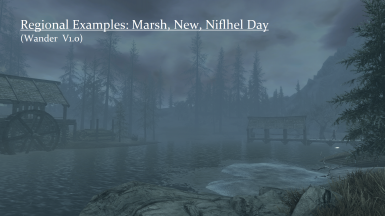 Each of the three editions share the same "Wander.esp" filename, so you can swap them out easier to test. Choose the edition that works best for your setup. 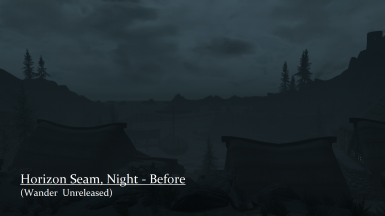 Comparison shots have been added to the screenshots section. 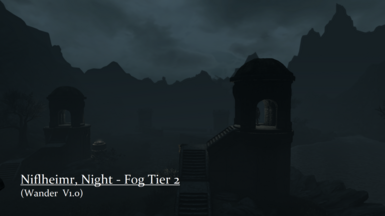 Wander gives Skyrim nights that are darker, days where you can’t see the details on distant mountains, chances of missing weathers spawning, foggier and hazy marsh and volcanic regions, and a few new weathers across every region in Skyrim. Hard to describe, easier to visualize, download Wander and give it a try! 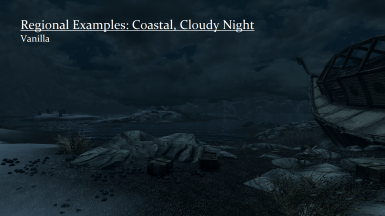 Wander is a weather mod focusing on three main objectives:﻿ 1, Darker Skyrim Nights. 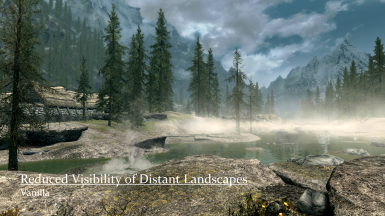 2, Reduced Visibility of Distant Landscapes. 3, Inclusion of Missing Regional Weathers. 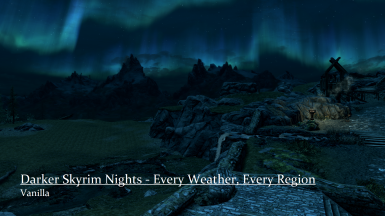 A lot of people agree that the nights in Skyrim are too bright, and you can count this wizard among them. 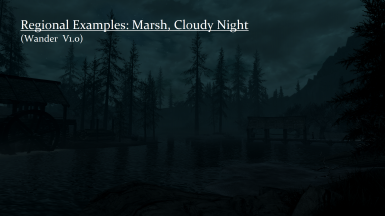 Wander darkens the night of every weather, in every region, to make the night more, well, night-like. This is a percentage based change, so there will be more light on clear nights as opposed to nights during inclement weather. Regional colors will still vary as well. 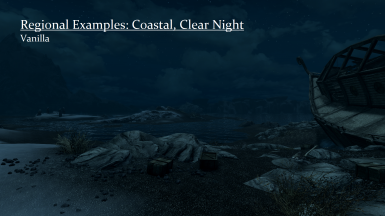 Wander tries to preserve the vanilla look and feel of every weather in every region while implementing darker Skyrim nights. 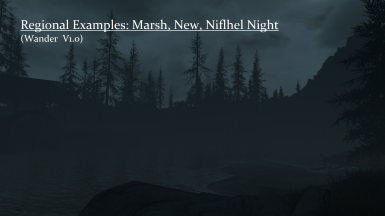 Now, monsters, thieves, and adventurers alike can all go out and enjoy the darkness of the night. I’ve always thought the ability to see crisp tree lods, and rock details on far away mountains looked a little off. The landscape should be more mysterious, and hide it's treasures better. I wanted to haze out the details on far away landscapes to include this air of mystery on all but the clearest of days. So I did. Because Wizard. 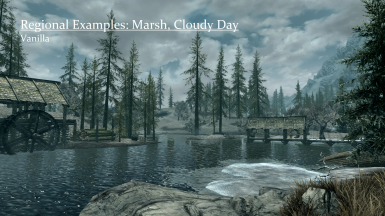 Distant landscapes across all of Skyrim will have hazier details than they did prior. 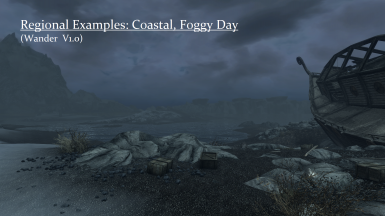 Different weather types will provide more or less haze to the details. Details are a bit hazy. Ha. 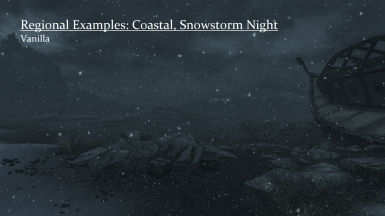 All of the regions of Skyrim have different groups of weathers that have a chance to spawn in that region. Quite a few of them do not have the chance to spawn a fog, or a snow, or a thunderstorm, etc. 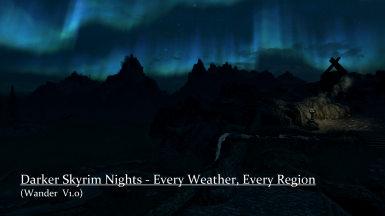 I’ve gone across all the regional data to include the chance for these missing weathers to spawn, as long as it made sense to do so for that region. 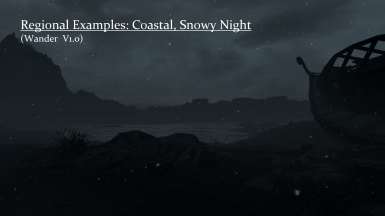 I’ve included charts in the screenshots section that show what weathers were added to what regions, as well as what percentage chance that weather has to spawn (as well as the vanilla chances to spawn). 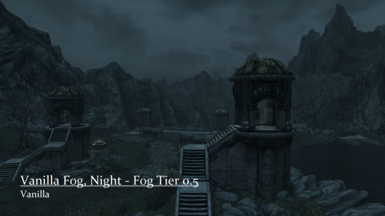 Apart from the main objectives, there are secondary alterations made to some of the vanilla weathers. 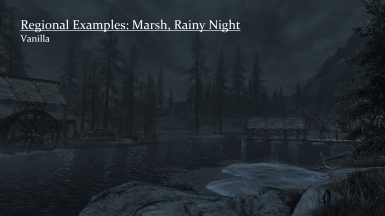 Wander adds a new rain sound and slightly adds more rain particles, to enhance the vanilla rain. 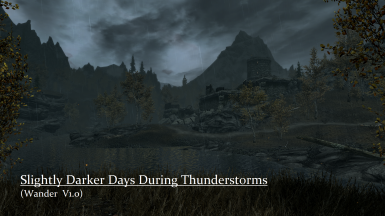 Wander makes thunderstorms a little more fun. 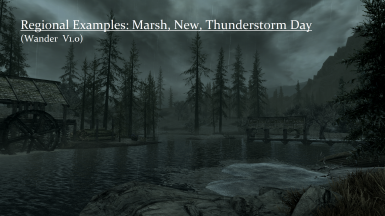 The vanilla thunder sound was rather dull and slowly looped. Wander has resolved this by separating the four thunder sounds out of the main record, and creating an individual record for each of them. 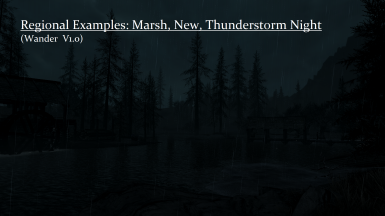 Thunder will now be varied, and more random. The thunder sounds are also now a little louder. 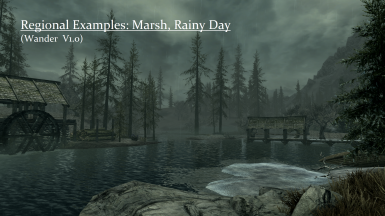 Additional unused vanilla rain sounds were included to make the rain sound more like a storm rain. 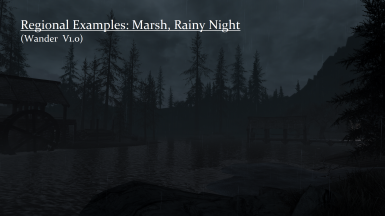 Rain particles were increased by a decent margin. 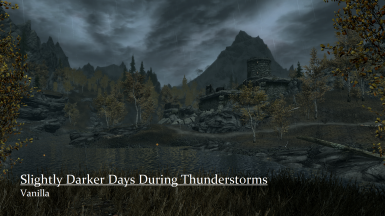 While wander does not do much to the daytime weathers, apart from decreasing distant visibility, in the case of thunderstorms, light in the daytime has been slightly reduced, and daytime shadows slightly strengthened. These are subtle changes to enhance this weather during the day. All of this makes for a much improved and enjoyable thunderstorm. 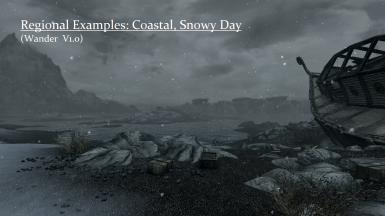 The "overcast snow" vanilla weather has been added to all regions, as Skyrim is a cold place. 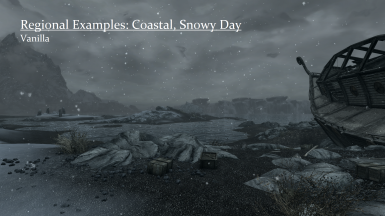 While it may not stick to the ground, flurries can still spawn to remind you that you are in Skyrim. 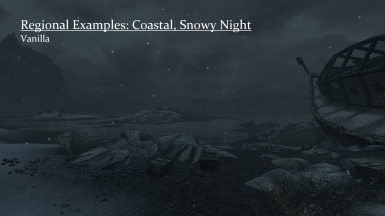 This light and fun snow is not a dangerous or powerful storm, so Wander removes the overly annoying in-your-face camera attachment, because flurries do not go straight for the eyes like some Argonian bandits do. 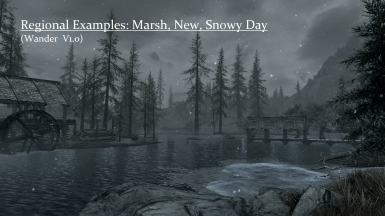 Now you can enjoy the chance of flurries wherever your adventures lead you in Skyrim. The mountain is on fire. Ash is spewing into the atmosphere. Now there will be more ash in the ash laden regions. 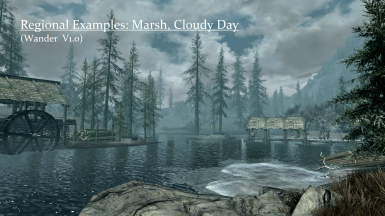 Cloudy days will now produce lite ash particles that the Ash storm produced. 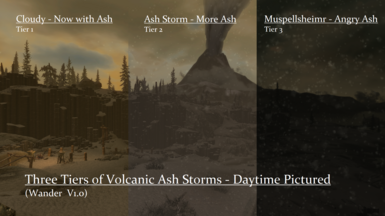 Ash storms will now produce more ash. 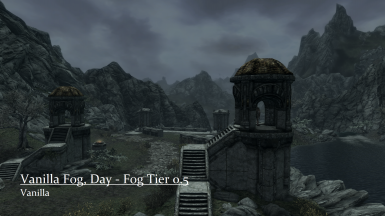 And without getting ahead of myself, there is another tier. You see where I'm going with this. Wander gives that Dunmer guard something to really complain about. 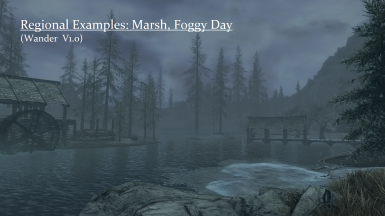 While Wander generally reduces the visibility of distant landscapes, that visibility has been further reduced in the marsh and volcanic regions, where warmer and colder temperatures are in their own constant civil war over the lower atmosphere. 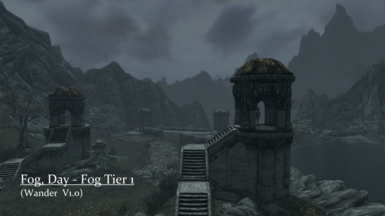 Instead of just making fog the only weather to spawn, Wander instead reduces the visibility of these areas by adding fogginess and haze to all of the weathers types that spawn in these locations, bringing the moisture in close, and creating a stronger fog and haze effect. 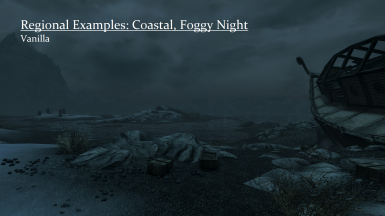 In this way, there is the same variance of weather types that you will find everywhere else, but with more moisture added to each of them reducing visibility. 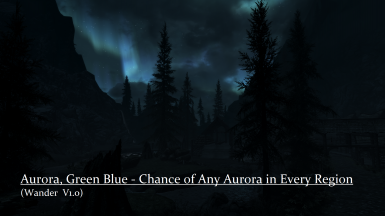 While wandering around the inner workings of the weathers, I realized that only two of the three aurora types spawn in any given region. 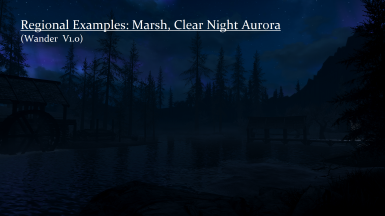 Upon further investigation I found that there was one poor unused aurora in the game files. 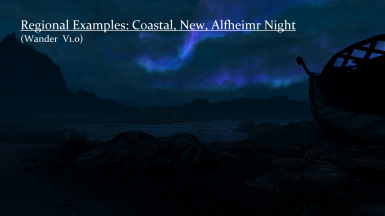 Enter Alfheimr & Vanaheimr. 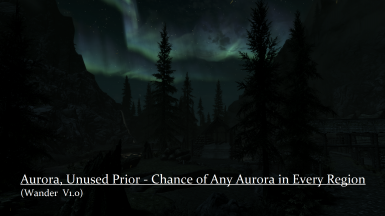 The third unused aurora in a region, as well as the new unused aurora were added as near duplicate weathers to the clear and cloudy aurora chances in each region. 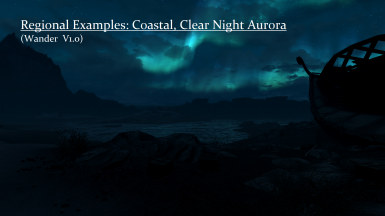 Each region had a chance to spawn an aurora weather 5% of the time. 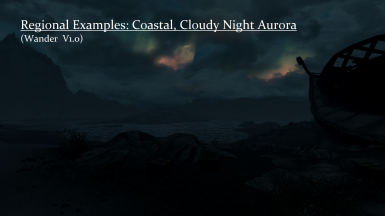 Each region had two Aurora weathers, one clear, one cloudy, giving a 10% chance for an aurora. 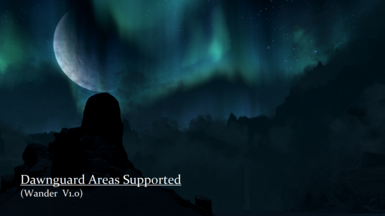 With the inclusion of Alfheimr & Vanaheimr each region now has the chance to spawn any of the four auroras. 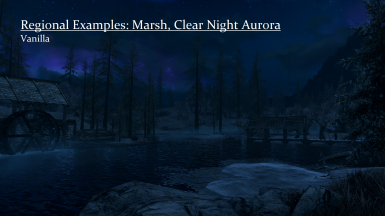 I’ve kept the aurora weathers as a 5% chance, including the new aurora weathers, so each region now has a 20% chance of spawning an aurora. 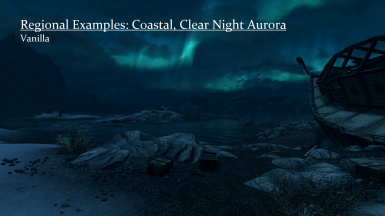 Examples of the auroras are included in the screenshots. Enjoy the beauty of the auroras anywhere you venture. 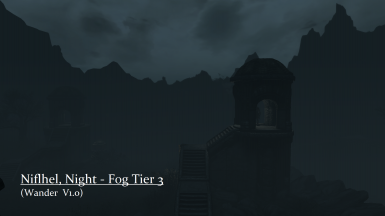 One of the things I wanted in this mod was more impressive and varying fogs. 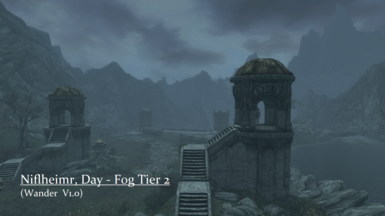 I always liked the vanilla weather in general, especially the fog, though I always wished it came in closer and heavier at times. It was always such a tease! 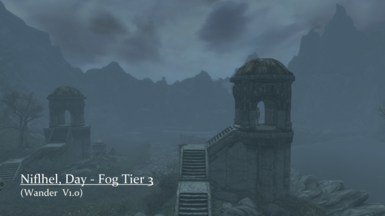 In Wander there are now three levels of fogs that can spawn. 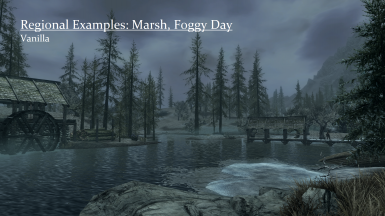 The vanilla fog , which has been altered to be a little heavier, is generally the weakest of the fogs (except in the marsh and volcanic regions where everything is a haze). 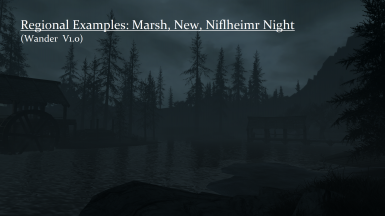 Enter Niflheimr & Niflhel. 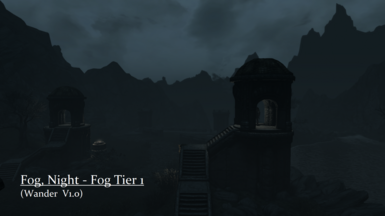 Niflheimr is a generally heavier fog, and Niflhel is the heaviest of the fogs. 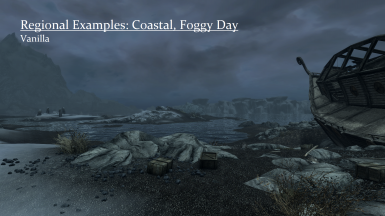 Both of these new fogs have a slightly different colorset from the vanilla fogs that spawn in most places, and both of these new fogs have a chance to spawn in all regions, except the places that don’t make sense (Solitude, Dragonsreach, etc.). 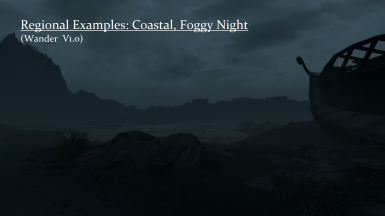 These new fogs do not have any camera effects attached, and are quite beautiful and mysterious during the day, and can be darn right spooky at night. Long live the Nifl! Another of the other weathers I wanted was a strong and powerful blizzard type snowstorm. 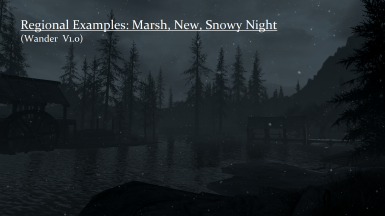 While the vanilla snows offered nice ambiance for a wintry mood, there did not exist a blizzard type storm to force you to hunker down and find shelter. 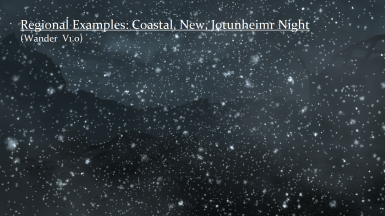 Enter Jotunheimr. 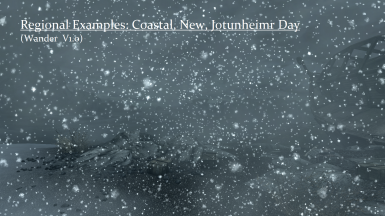 Jotunheimr is a powerful whiteout blizzard befitting of Skyrim. 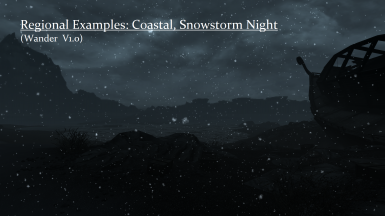 The storm produces a lot of snow and wind, a turbulent camera attachment, and the additional roaring of distant thunders, providing a menacing overtone to the storm. If you encounter Jotunheimr during the day, you will want to find shelter before nightfall, while you can still navigate. 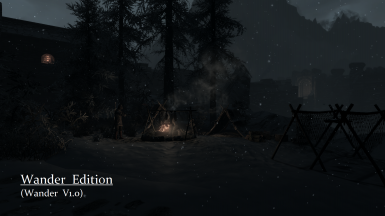 Skyrim is a cold and harsh place, and the Jotunheimr will remind you of that. 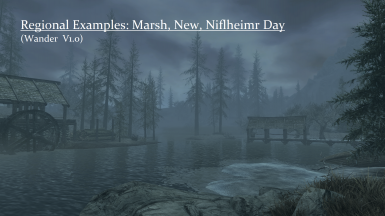 The last of my new weathers, I wanted the chance for a violent and dangerous ash storm in Solstheim. Enter Muspellsheimr. The thick ash plume blots out the sun, and darkens the sky, bleeding day into night. Thick gagging ash will make you want to run for cover, and for air. Roars of distant thunder with orange-red tinted lightning light up the landscape in flashes through the dark clouds. 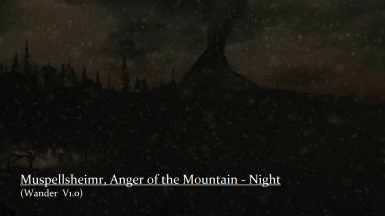 You will feel the wrath of the Red Mountain, and know it is angry, for the Muspellsheimr is it's voice. Or bad breath. 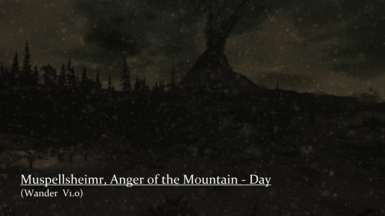 I'm not entirely sure, but the Red Mountain is angry, and you will feel it's wrath. 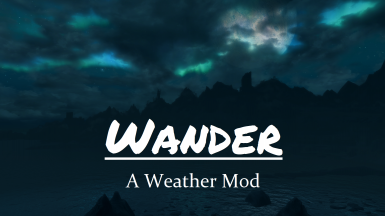 Wander will strive to keep the look and feel of the original vanilla weather system, while implementing the main objectives. That being said, when you begin to change the weathers of the world, the world fights back. 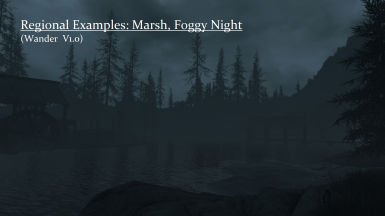 There are some things that need to be altered to make the new weathers look and feel right, such as glowing effects now looking too bright, or that water edge that doesn't like foggy weather. Evil water edge, I'm going to get you in Version 2. 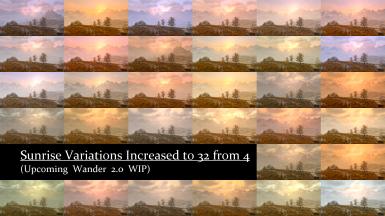 Wander will try to keep these changes to a minimum and find a good balance between adapting Skyrim to make Wander work right, and altering Skyrim unrecognizable. 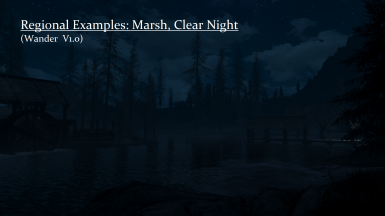 I had to tune down the environmental effects a lot to get glowing effects to fit in with the dark nights. Effects. Boot. Boot. Effects. While this corrected the issues from glowing environmental effects, I'm unsure if it affected any other types of effects. 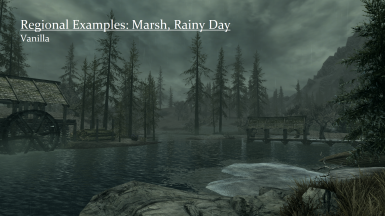 I don't believe it did, if anything it should make non-environmental effects look brighter in the darker environments, but be on the lookout for reduced brightness in effects and let me know if you find anything. 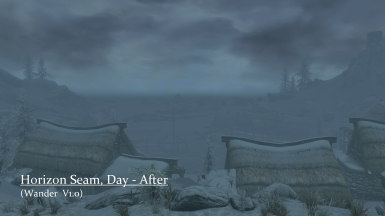 Another side effect of darker nights. 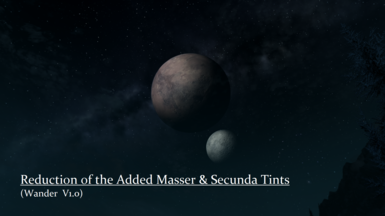 An extra red tint of color for Masser and Secunda is recorded in each of the weather records. After darkening the nights, I found the extra red tint added really stuck out. 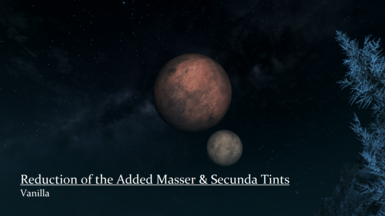 Wander calms the extra red tint of the red moon down to it’s base red (think Mars), so that Masser does not stick out like a sore thumb any longer during the darker nights. 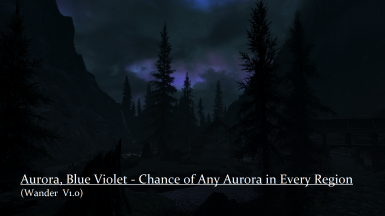 Now, as a side effect of that, it picks up on aurora colors spectacularly as you can see in the title shot. A side effect of correcting a side effect. 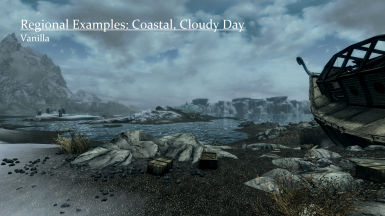 That’s modding the weather for you. 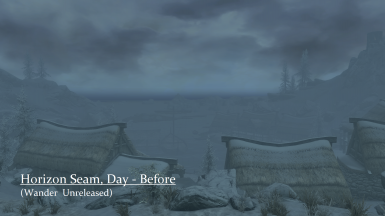 These changes also alter Secunda. Screenshots are included showing the differences between the two. 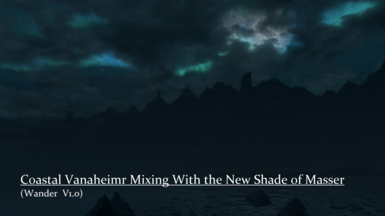 Alduin. Hah. 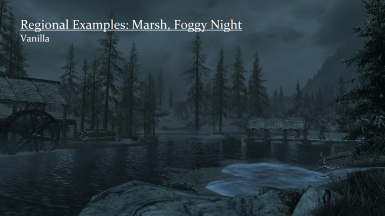 The real enemy of Skyrim is that darn water's edge that glows white in inclement weather. I've explored and altered the weather records to minimize the additional impact of the more inclement weathers, but the edge remains. 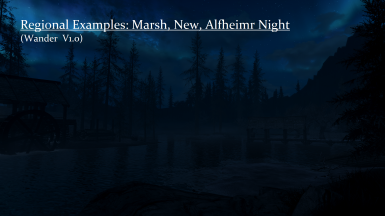 I have more experimenting to do, and in version 2 there will likely be a mixture of magic and sorcery and water record changes to further mitigate this evil. It remains ever on my mind. And my screen. I am currently reviewing the existing data for any errors, while giving time for the community to try out Version 1 and offer any feedback. 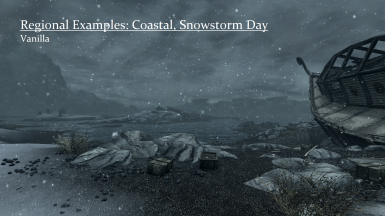 There will likely be some added subtle median variations to the existing weathers (such as a version of snow between the overcast snow and the snow storm weathers), as well as some new Themed Editions with different percentage chances of weathers (such as an all fog Edition, or an Edition that consists of only pleasant weathers). Wander does not require anything other than Skyrim and it’s DLCs. Wander modifies nearly all of the "Weather" records, most of the "Region" records, and a few “Sound Descriptor” and "Shader Particle Geometry" records in Skyrim. 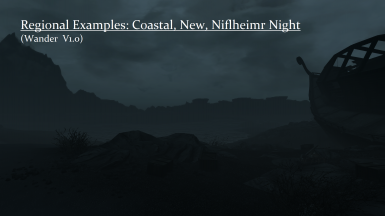 Any mod that modifies these same records will conflict in some way with Wander. 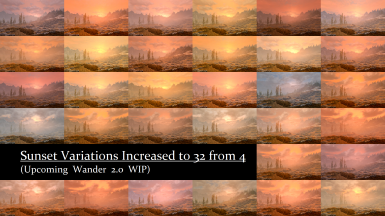 Wander does not modify light sources, textures, or meshes. 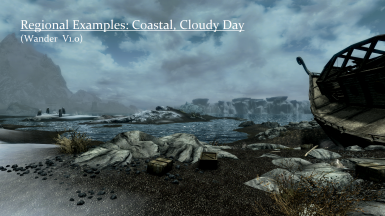 Wander does not modify the world map weather either, so it’s safe to use mods that modify the world map weather. 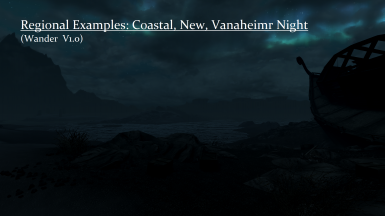 All current and future Editions of Wander will consist of a single “Wander.esp” file. 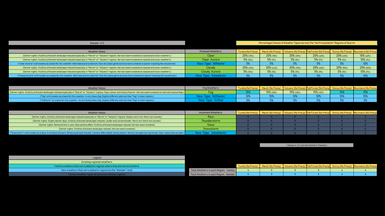 Download it and place this file in your "Data" folder. I cannot offer any advice as far as mod organizers go, as I have no experience using them. 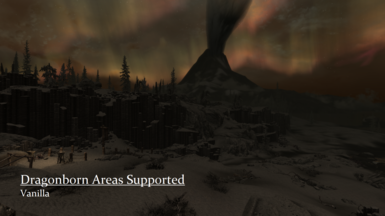 You are free to use and modify Wander in any way that will enhance your personal playing experience. 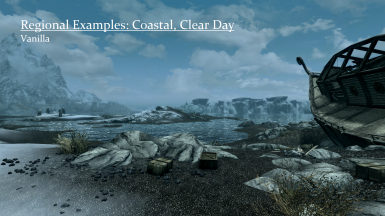 In fact, I encourage you to learn to modify Wander to your liking if you haven’t tried out modding before. You may find that you enjoy it as much as I do! 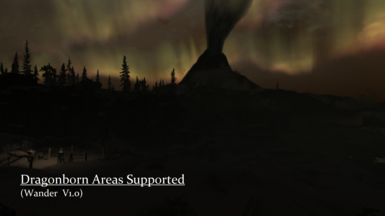 If you need any help or advice, ask away in the forums. I'm an old wizard that doesn't check his emails but once a month, though i will respond to all questions in time. 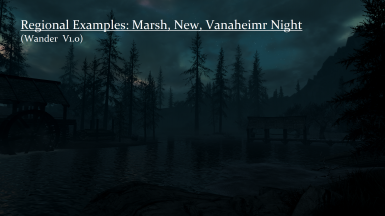 Please don’t upload a full or tweaked version of Wander somewhere else. Wander has been released on Bethesda.net for the Xbox and PS4. 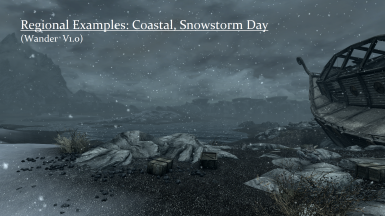 Thanks to the various creators of other weather-related mods, my predecessors and colleagues, for letting us know that all of this was possible. Thanks to the participants of all the various random internet postings on weather related issues, problems, and discussions, which continually give countless insight. 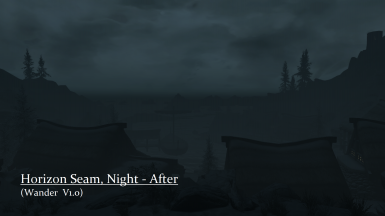 Thanks to Bethesda for one of the truly most enjoyable games I’ve ever had the pleasure of playing. Hope you all enjoy Wander! Now, get adventuring!